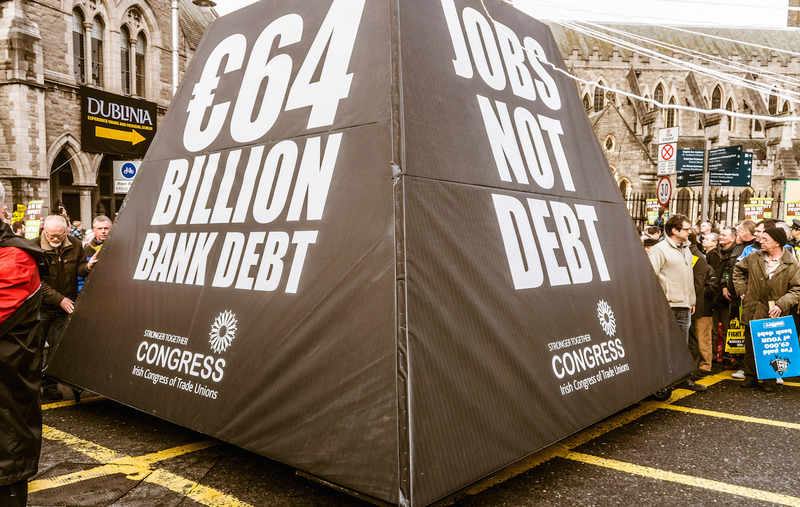 Defend democracy – don’t repay your debts. Our dependence on debt means that banks wield ever-greater power over our lives, writes Daniel Edelstyn. Pretty much everyone is in debt these days; from homeowners to university students, credit card holders, those with overdrafts in Britain to the sick and those without proper insurance in the US. The last 12 months have seen a 10% increase in the average household debt in the UK, and a 35% increase in county court judgements – for people who have not been able to pay their debt and have been reprimanded by the courts. There are notable exceptions to ‘pretty much everyone’. Andrew Ross, author of Creditocracy, draws our attention to the sector prospering while everyone else struggles: the banks. Statistics showed how bank profits had leapt up ahead, while everyone else was deep into their overdrafts. Meanwhile austerity programmes were being rolled out global economic north. Ross showed the asset sheets of the banks in relation to the developed US & Western European economies were dwarfing the GDPs of their host nations. In other words, in 2013 as our economies were weak and debt-ridden situation, the banks were simultaneously very vulnerable and also making enormous profits. Just four years on, according to some registers, UK Bank assets stand at 900 per cent of GDP. In the history of economic records, we have never been in a time where asset prices are as inflated relative to earnings, ever. All the signs are with us, our debt burden is huge and looming over us. But what is a creditocracy? According to Ross, this is a situation in which debt mediates access to all the basic social goods, goods which had been free (such as healthcare), or affordable enough not to necessitate going further and further into debt. In such a situation, power is centralized in the hands of private financial organisations, on which all life seems to depend. Maggie Thatcher’s policies of subjugating manufacturing, systematically undermining the unions, while at the same time setting the financial industry free from red tape ushered in this era of financialization. It wasn’t just in Britain – her old ally Ronald Reagan was doing the same thing in the US, and Europe too had brought in an era of increased personal debt as welfare capitalism was being stripped back. As the governments were spending less on their citizens, the costs were being passed over to the private sector, suddenly we were having to pay for education, less houses were being built and rents were spiralling, public & private sector pay rates were growing slower than inflation – so real wages were falling. The Western dream, predicated on home ownership, access to high level education, luxury goods such as cars and good quality furniture, holidays to exotic destinations – all these were slipping away from the average household, but they remained accessible with credit. Worse, the safety nets beneath which it was supposed to be impossible to fall, and which had represented the apex of our Western capitalist democracies were being cut to ribbons. This exercise was underpinned by an austere Victorian language, and it was a justification the public believed in, but it masked a darker reality – that reality was that the next frontier of the free market was the work of the post war generation – privatising and feeding on the achievements of our welfare states. Public goods were being privatised, a terrible process had been unleashed and it seemed that it was largely unreported. Some organisations are fighting back; ‘Strike Debt’ in the US has bought up then ‘forgiven’ millions of dollars worth of medical and student debt. The private burden of debt is shouldered by the collective – thus breaking the spiral of more interest and more indebtedness. According to Debt Collective activist Laura Hanna: “One thing’s for certain, things are not going to change unless people actually start to act themselves and build power at the grassroots scale. We are not going to have a system change from above.’ When we refuse to accept a situation where people have to bind themselves in debt to afford the basics of healthcare, housing and education, we take power out of the hands of debt-financiers. ‘Loans which either benefit the creditor only, or inflict social and environmental damage on individuals, families and communities, should be renegotiated and compensate for harms. The sale of loans to borrowers who cannot repay is unscrupulous and so the collection of such debts should not be honoured. When debt is refused or bought up, public bodies should not offer to compensate or reimburse banks or their beneficiaries, awash in profit, have done very well; they have been paid enough already. The credit was not theirs to begin with – most of it was obtained through the dubious power of money creation, thanks to fractional reserve banking and the “magic” of derivatives. The right to claim unearned income from debts so easily created should not be recognised as binding.